Kevin Keller, the only gay character in the Archie Comics universe, gets his first on-panel smooch in the latest issue of his series offshoot "Kevin Keller," released Wednesday. 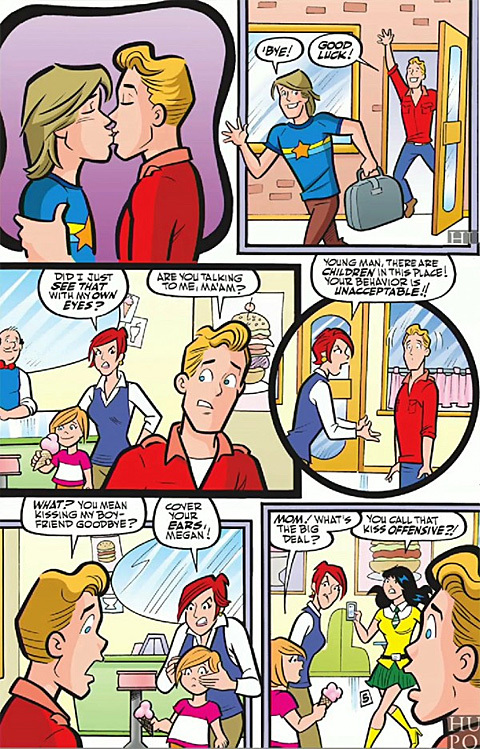 Things take a turn for the controversial when a local mom spots Keller in the middle of his chaste peck (this is Archie Comics, after all), exclaiming: "Did I just see that with my own eyes? Young man, there are children in this place! Your behavior is unacceptable!" Creator Dan Parent told the Associated Press that he was inspired to write the story line after One Million Moms launched a boycott against an issue of the comic depicting Keller's wedding. Parent called the plot a "playful poke" at the group's outrage. Keller's sexuality makes his kiss a major first, but on-panel displays of affection are pretty rare for any character in the long-running, old fashioned series. "There aren't that many on-panel kisses in the pages of Archie, but you often see the lipstick on Archie's face afterward," said publisher and co-CEO Jon Goldwater.